RealAutoTips. - Automotive field will not released from electricity and electronic field. We know that the automotive technology advanced because supported from electricity and electronic technology. There are many electronic technology using high advance technology that used to support automotive field. 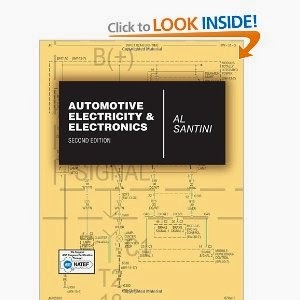 To support you know more correlation about automotive, electricity and electronic field, in here we will show you one book that titled Automotive Electricity and Electronics Second Edition that authored by Al Santini. In here beside we will give you global information about Automotive Electricity and Electronics Second Edition by Al Santini as book description, here we also will give you link to take Download E-book of Automotive Electricity and Electronics by Al Santini. Today's automotive technicians need a thorough understanding of electrical principles and electronic systems to service modern vehicles. With Automotive Electricity and Electronics, you can explore how automotive electronics work, the role they play in a vehicle's normal operation, how and why technicians use test instruments, and common diagnosis and repair procedures. The text provides a solid grounding in the fundamentals of electricity and electronics, giving you the foundation you need to master advanced topics such as batteries, starting and charging systems, ignitions, and electrical accessories. Practical testing procedures are covered as well, including the use of both common shop tools and highly technical equipment. The text also includes up-to-date coverage of current systems, tools, and J1930 terminology. A new hands-on Study Guide/Lab manual is available to help you apply what they learn and prepare for career success.